I am impressed with the ability of the iPhone / iPod Touch application Instapaper Free to create offline, mobile-friendly versions of any webpage. The following five minute screencast demonstrates how you can do this on an iPhone or iPod Touch. 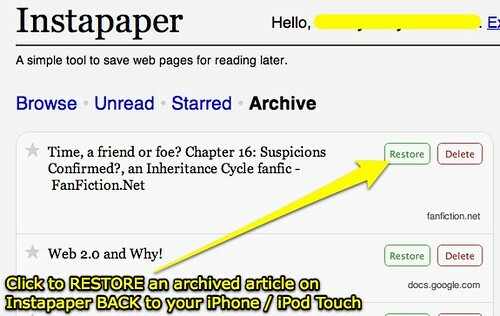 You’ll want to download the Instapaper Free application first and create a free Instapaper account. I love how Instapaper formats webpages which are NOT “mobile-friendly” into very usable / readable versions, which are available offline (when you do not have connectivity to WiFi or cellular network data service) after you “refresh” your Instapaper application to sync up online. Instapaper also works with Google Documents, although they are in a “read-only” format when you make a copy of them with Instapaper. This is a GREAT, free application which certainly has MANY potential applications for 1:1 learning settings when all students have access to an iPod Touch, or when students are using iPod Touches on a mobile cart at school. I also have shared my iPhone application list via Appolicious. I love Instapaper! Many applications now have “Read Later” Instapaper capabilities. For example both Tweetie and Mobile RSS work with Instapaper. One feature I know that the paid version has, not sure about the free one, is the tilt to scroll feature. I wish other apps had the same. What are your thoughts on the 10 article limit in the free version? Does that still exist? Wes – I’m wondering if you could share how you captured the live motion iPhone screen into Screenr? This looks like something I could really use as I try and explain iPhone/iPod Touch apps to my colleagues. Yes Ron. I used ScreenSplitr and DemoGod, after using blackra1n. All are free. Ted Landau’s October 2009 article in MacObserver about ScreenSplitr gives a nice overview.